1. Certificate of compliance TUV-NORD No.07-701-PZ-1011-P01 for production of pipes from steel grades E235, E275, E315, E355 ø 21,3-168,3mm with wall thickness range 3,0-25mm to the requirements of DIN EN 10297-1:2003-06. 2. Certificate TUV NORD (Germany) No0045-CPR-1011-EK2 for production of corrugated steel fiber for concrete according to the requirements of EN 14889-1:2006 and European building regulations 305/2011 (right to apply CE-mark). 3. Certificate TUV NORD (Germany)No0045-CPR-1011-EK3 for production of steel microfiber for concrete according to the requirements of EN 14889-1:2006 and European building regulations 305/2011 (right to apply CE-mark). 5. 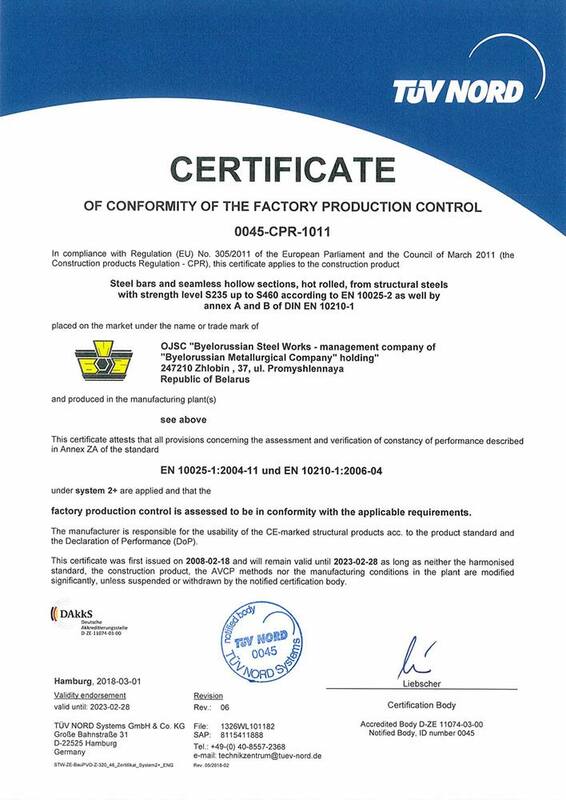 Certificate of TUV NORD Systems (Germany) № 07-203-1326-WP-1011/14 for production of hot-rolled steel bars and seamless tubes from ferrite steels according to the requirements of AD 2000-Merkblatt W0.